This year marks the 10th Anniversary of Urban Sketchers worldwide. 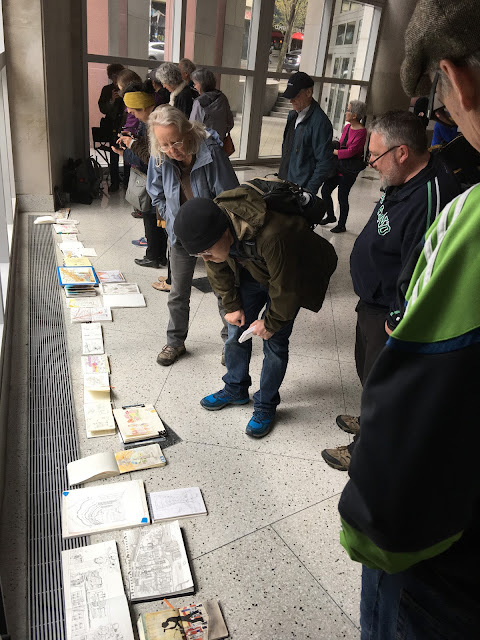 As we met at Seattle Art Museum on Sunday morning, I knew several of my fellow urban sketchers would stay in the lobby to draw the new installation of John Grade's "Middle Fork". In the spirit of group reportage, I decided to make the short walk up to Pike Place Market and find something iconic and celebratory to commemorate the first weekend of spring. Winter was finally over in the city where Urban Sketchers was founded. The Gum Wall, the Balloon Man, an abundant display of cherry blossoms--all seemed a celebration of the first weekend of spring. The gum wall was my first destination. After a steam cleaning in November of 2015 removed 2,350 lbs of accumulated gum, for the first time in 20 years the brick walls in Pike Place Market's Post Alley were clear. I thought it was about time to see how the "mural of gum" looks now. Jackson Pollock would be proud. I doubt, however, that his work was usually greeted by exclamations of "Ewwww!" and warnings of "Don't touch it!" 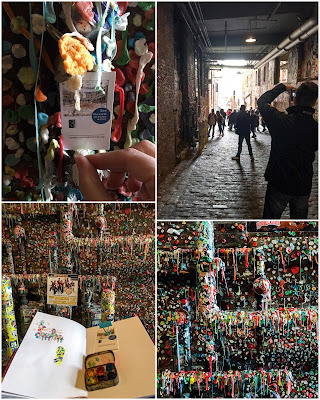 as people do when they first encounter the gum wall. But then you can't contribute to one of Pollock's compositions either. And it reminds me of a freeze frame photo of confetti and fireworks! Farrell Thomas The Balloon Man, aka Twister Thomas, is one of the colorful denizens of the Pike Street Neighborhood. Balloon animals are quite festive aren't they? Thomas has a spot by the information booth. 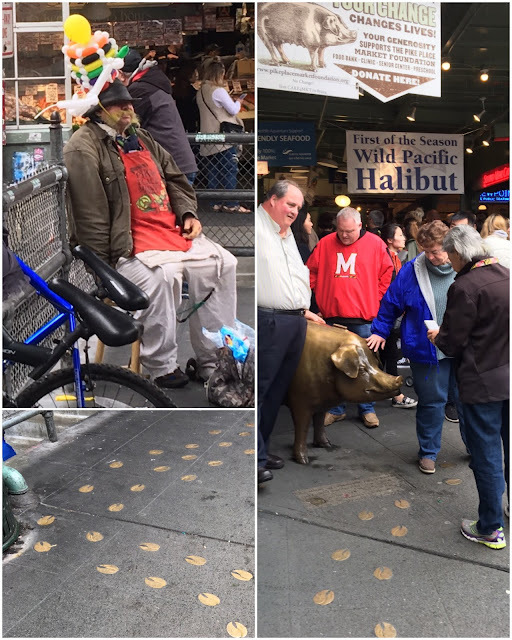 Brass hoof prints at his feet lead to another market icon, Rachel the pig. A few drops of rain fell from the overhang I was using as cover and blotted my sketch of his face a little, but I think it just gives more character to the quick study. As it continued to rain, I retreated further under the shelter of the entryway of DB Laurenti's on the corner of 1st and Pike. I considered sketching the iconic news stand, but the full blossoms across the street looked like puffy pink kernels bursting out of the top of the trees like movie popcorn. A celebration of spring! I finished my sketch of the cherry trees and the street corner. By now it was time for me to walk back down two blocks and meet with Seattle Urban Sketchers at the SW lobby of SAM to share our sketches. We covered the entire Pike Street Neighborhood, the museum and more. As you can see by other posts on the subject, we had a great turnout for our first weekend of Spring! I saw wonderful sketches of the installation "Middle Fork", the stone sculptures of camels on the stairs, street views up and down the block, the "Hammering Man" and examples from various exhibits that were personally chosen by each artist. It turned out to be a celebration of Seattle, urban sketching, reportage and spring! Love the burst of cherry trees! And excellent sketch of the Gum Wall (though I think you missed a blob ;-) ). Thanks, Tina. I was pleasantly surprised to find the cherry trees in full bloom when those at the UW have disappeared. In the case of the gum wall, I did minimize that extra blob but I feel less is more. Hehe.